Salvatori is the UK's longest established processing fruit trader. It has been handling top fruit in the Canterbury area for more than 80 years and using the same Dolav plastic pallet boxes for more than 25 years. 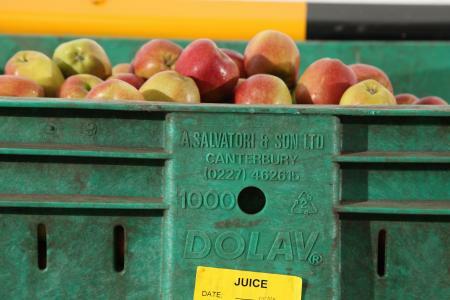 A leading supplier to UK's largest juice and cider producers, Salvatori supplies apples for juice in Dolavs from supply partner company Newmafruit International in Kent. Newmafruit has 1000 acres of orchards and grades apples to Class 1 for supermarket/retail, Class 2 for wholesale markets and other for juice fruits. All Newmafruit site staff know that juice fruit go into Salvatori's Dolavs. 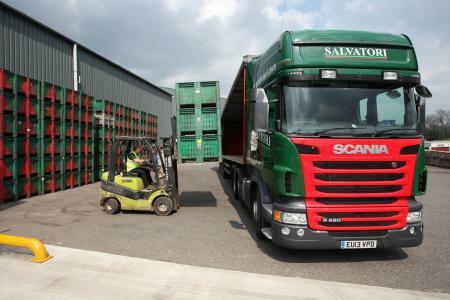 At Newmafruit, Salvatori's Dolav boxes have been in continuous use for some 25 years with about 1000 on site and a similar number in transit or in store. According to site manager, Ken Ellis, who has been with Newmafruit for 41 years, "The Dolavs last far better than wood and even after 25 years most Dolavs are in good condition and have been in daily use since 1990." Fruit for juice has to be kept clean and stored at around 3 degrees Centigrade. It must be stored for the juice makers in a suitable condition for processing for human consumption. Newmafruit is BRC Accredited and the Dolav plastic pallet box, even after 25 years' service, meets all current and anticipated food and juice fruit handling standards. Dolav's newest box, the Dolav Ace has been recognised by food-technology specialists at Campden BRI of having 'hygienic design'. Like the original Salvatori Dolav boxes, it is widely used in food production for fruit, vegetables, meat and fish.